BaZi is the ancient science and arts of Chinese astrology. BaZi literally means eight characters (or four pillars) and they are derived from the year, month, day, hour of birth. 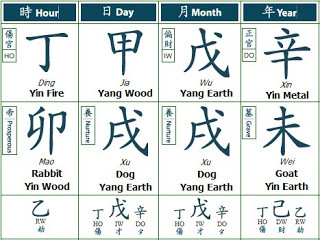 and express in the form of the Five Elements – Wood 木, Water 水 , Earth 土 , Fire 火, Metal. Example: Bazi chart formed by eight Chinese characters or four pillars. How BaZi destiny analysis can assist me in my life? BaZi analysis enables us to explore the cyclical influence of our 'destiny' in important areas such as family, friends, relationships, wealth, fame, health, career, studies and business. BaZi can be used to evaluate relationships and to forecast the life path of each individual. Understanding our BaZi helps us to deal with uncertainties and allows us to understand our strengths and weaknesses in life. Factors such as luck are often indomitable and not within our grasp. BaZi analysis is designed to help us understand the cycles of luck and possibly understand how it influences our lives. BaZi analysis is about assisting and guiding people to understand more about themselves and the power of choice. The analysis will be equipped with key knowledge for adjusting your perspectives and improving your attitude, having realistic expectations and being prepared before any obstacle arise. Every choice and decision you make affects your life.